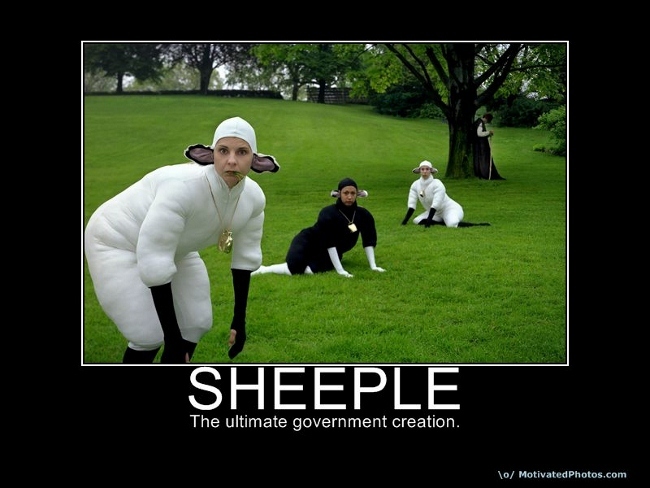 Sheeple is a term of disparagement, in which people are likened to the herd animals sheep. The term is often used to denote persons who voluntarily acquiesce to a perceived authority figure’s suggestion without critical analysis or sufficient research to understand the ramifications of that decision. By doing so, Sheeple undermine their own individuality and may willingly give up their rights. The implication of the term is that people fallaciously appeal to authority and believe or do what they are told by perceived authority figures who they view as trustworthy. Have you heard about the Sheeple Quiz? It’s a fun quiz to find out how smart (or gullible) your friends really are. So let ‘EM take the Sheeple Quiz! And then you’ll know whether they’re independent thinkers or just zombie-minded sheeple like the rest of the flock. B) Loot the economy and control America’s economy in the interests of the few. You are a total news-watching, gullible fairy tale swallowing Sheeple! Be sure to keep taking those medications and watching more network news. Don’t bother thinking for yourself because you seem to be incapable of accomplishing that.